Carter's book, Boom, Bust, Boom: A Story About Copper, The Metal That Runs The World, is now out in paperback, just in time for Earth Day. Bill Carter will be joining us in the comment section below to answer your questions. (Update: Turns out I may have put up this post a wee bit early, but Bill will be here soon! Leave your questions for him now, and check back later!) We asked him a few questions about his work to get you started. Copper is the sort of mundane material most people don't spend much time thinking about. What are the major roles that copper plays in our everyday lives? Bill Carter: Copper has been mined by various civilizations for 10,000 years. In the Bronze Age copper became the metal of choice to create weapons. Think the Romans. They didn't create their empire so we could make cool mini series about them. They waged bloody wars in order to have access to metals such as copper and tin. The mines in Carthage were copper. The invasion of England was to take control of the tin and copper. And before them the Egyptians ran a copper empire based in the Sahara. And so on. Then the big shift was the discovering of electricity. Since that discovery, copper has become ubiquitous in our lives. It conducts heat and electricity and is every computer, phone, car, airplane and just about anything that has an electrical current. In the average car there is 50 pounds of copper. In a jumbo jet there is 9,000 pounds. Every home has up to 400 pounds of copper, both in wiring and in the plumbing... It is quite frankly the metal that runs modern civilization. What are the biggest environmental hazards that we face as a result of the actions of the copper industry? BC: Copper mining is classified as "hard rock mining." This is different than coal or iron ore. Hard rock mining is the single largest contributor of toxic pollution in the United States. Copper as a mineral is natural in our blood system. Too little of it we can die. Too much of it we can also die. Most of us don't have to worry about it. It occurs naturally in our foods. But the extraction of copper from the earth creates a large environmental problem. Copper doesn't come out of the earth alone. When the minerals formed almost 200 million years ago various heavy metals were naturally attached to the copper. Metals such as uranium, arsenic, lead, and cesium. These metals are all toxic to our life systems. So, when we extract the vast amounts of earth to get the copper, we then dump the other dirt in large piles, called waste rock. That pile of rock, which is really tens of millions of tons of dirt from a hole in the ground, then begins to erode. This causes Acid mine drainage, a runoff of sulfuric acid, which has the toxicity of battery acid. Stopping this is nearly impossible for mining companies and eventually, over time, this will usually get into the watersheds. That is just one of the problems, there are more. Are there any plausible ways to make the copper industry environmentally sound? BC: Not entirely, but there are ways to isolate the damage to regions that are not close to water systems... The real answer will most likely be a new technology, a new alloy or graphite that will both conduct electricity and be cheap. Something like that is most likely more than a generation away. Just a side note: most people don't know this but if a mining company, including a foreign mining company, mines on federal land, they pay $5 an acre and $0 royalties to the U.S. government. I don't know about anyone else but this feels very wrong. 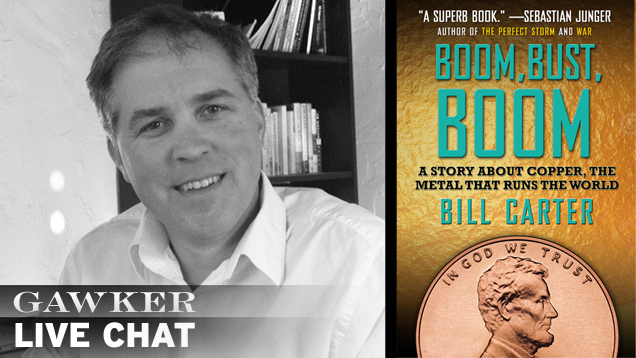 Leave your questions for Bill Carter in the discussion section below.